According to Mark Gevaux, aka the Rib Man, the ribs he sells are “free range babyback ribs from pigs that are outdoor reared on Norfolk and Suffolk farms”. He sells them “as full racks, half racks, rib meat rolls and rib meat wraps”. We can confirm that the massively packed meat rolls are awesome (in a juicy, tender oh my god this is delicious kind of way) and priced nicely indeed for a mere fiver. 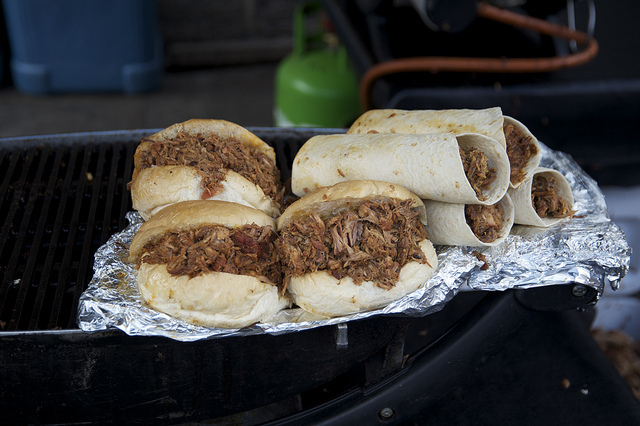 Top quality, huge and cheap, the Rib Man's rolls and wraps represent some of the best barbecued pork to be found in London. It's a shame, but even that much more of a treat, that his offerings are only available at Brick Lane's weekly Sunday market. You can find the Rib Man at his Brick Lane stall on Sundays “from about 3am cooking and getting ready to serve by 9am”. He closes when he sells out of meat, and if the weather's nice that can happen fairly early in the afternoon. Visit his website for more details, contact info and news about possible other locations to eat his ribs.